Welcome to August, my friends! 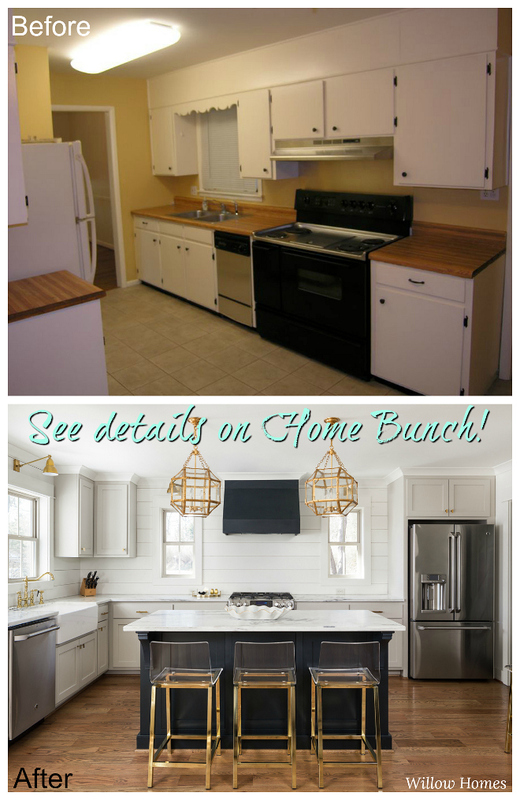 I love this month and I am super happy to be sharing this farmhouse renovation. The “before and after” pictures are jaw-dropping! 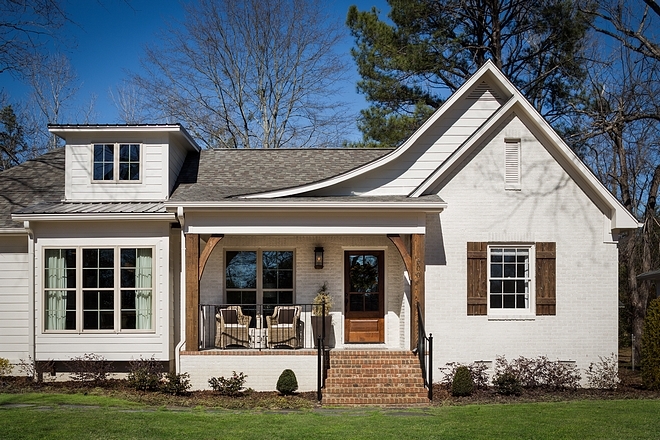 Recently completed by Willow Homes and with interiors by Willow Design Studios (featured here), this project was a remodel that took about nine months to plan, design and renovate. 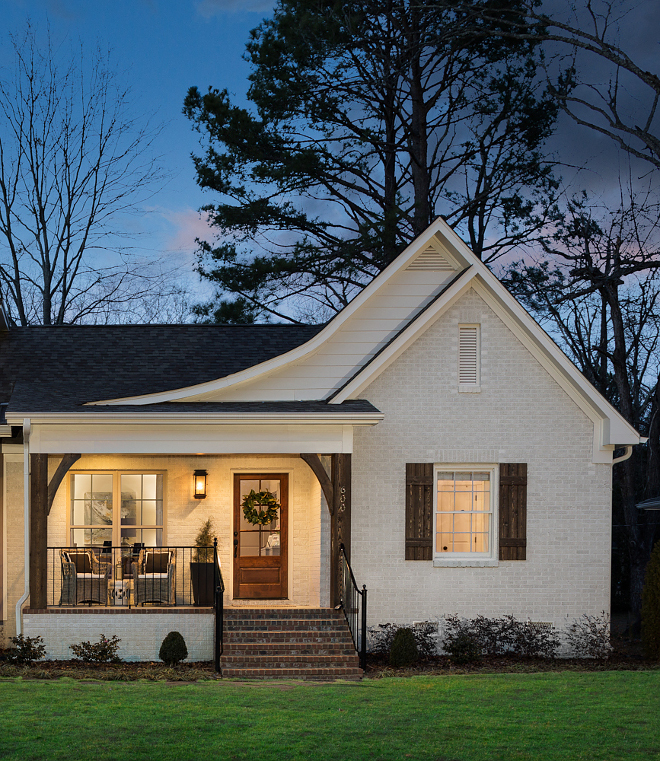 This “small farmhouse” – it is a one-story home – won Best in Show in its price point category at the 2018 Alabama Remodel Excellence Awards, which is a statewide remodeling competition with over 100 entries! 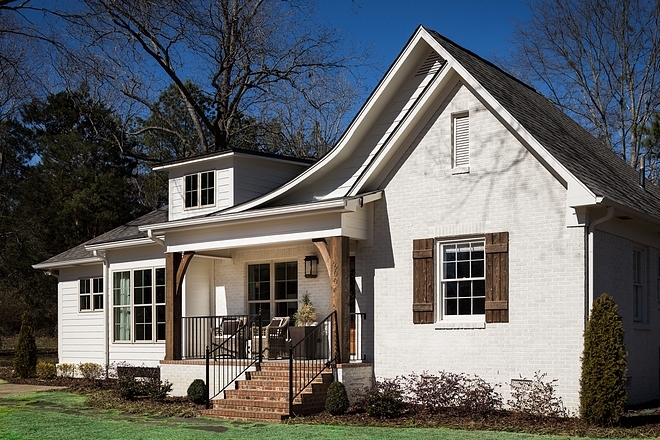 Home Exterior Paint Color: Oyster White by Sherwin Williams. Windows are wood, painted in an exterior almond paint color. 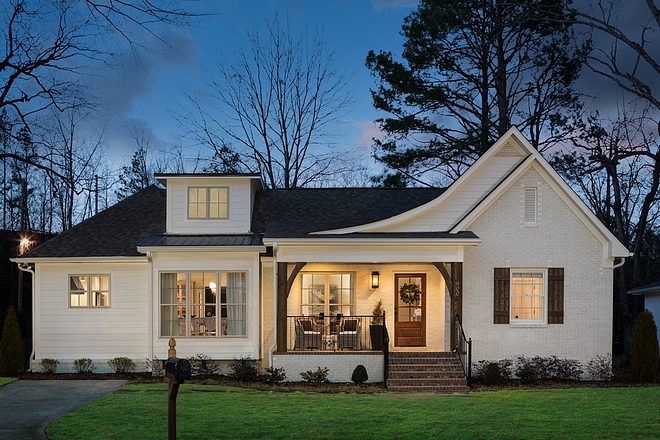 Shutters and timber columns add to the curb-appeal of this home. Outdoor chairs on porch are Gabby – similar here, here & here. 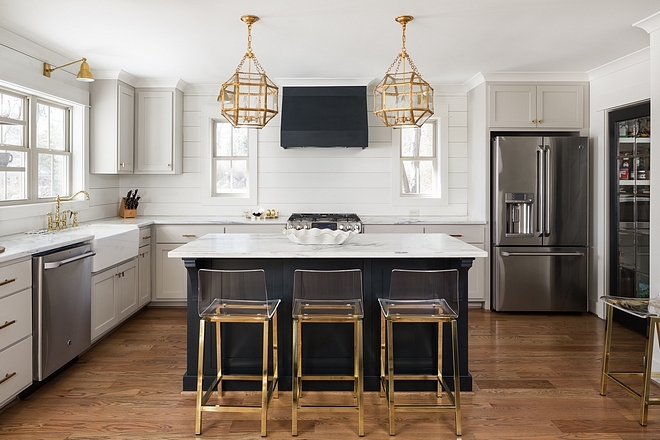 What a dreamy kitchen! 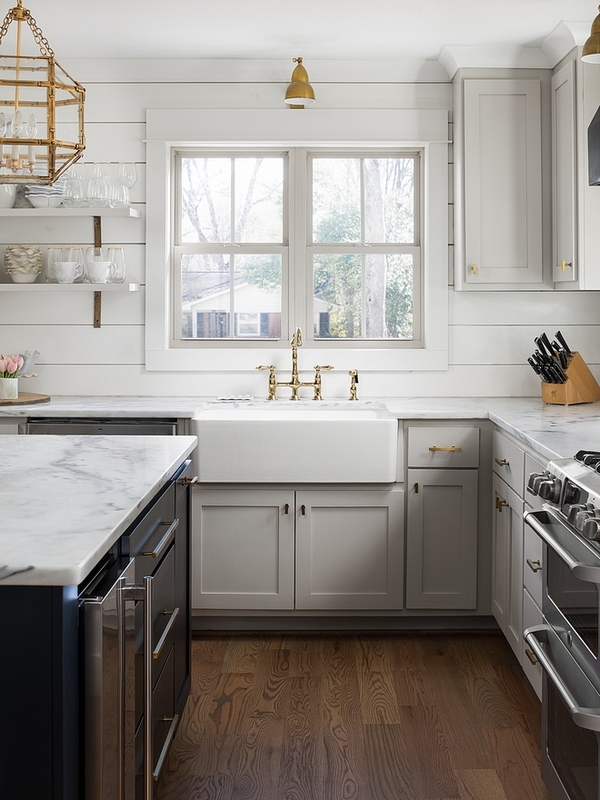 As you can see here, the square footage is something you will find in most homes, but the way the kitchen was planned makes a huge difference! Kitchen Cabinet Details: Shaker Style Cabinets. Hardwood Flooring: 5 inch Red Oak hardwood flooring with Provincial stain by Minwax – similar here. A wall was demolished to open the space and make the kitchen feel connected to the rest of the house. 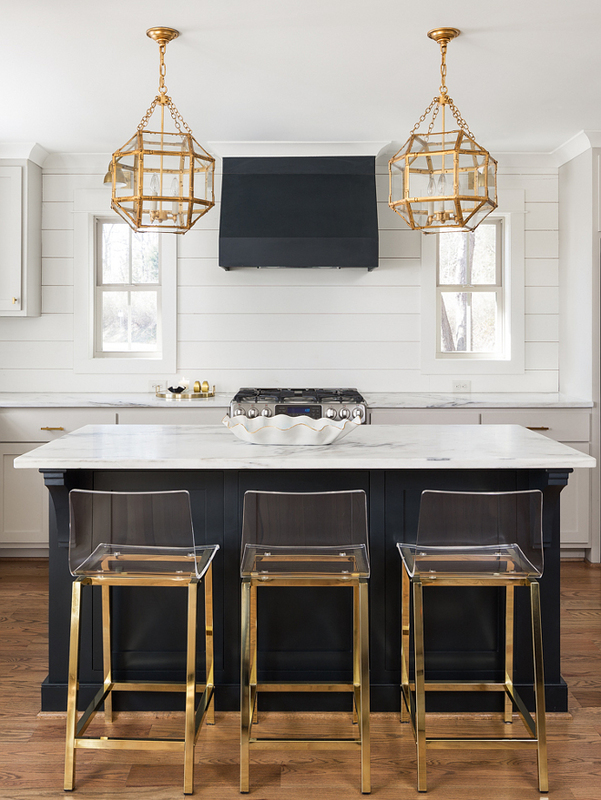 Kitchen Island & Hood Paint Color: Blue Black by Farrow and Ball. 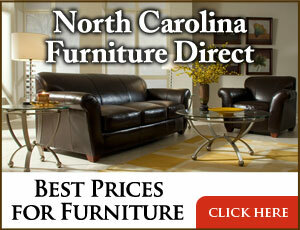 Counterstools: Overstock – similar Here, Here & Here. 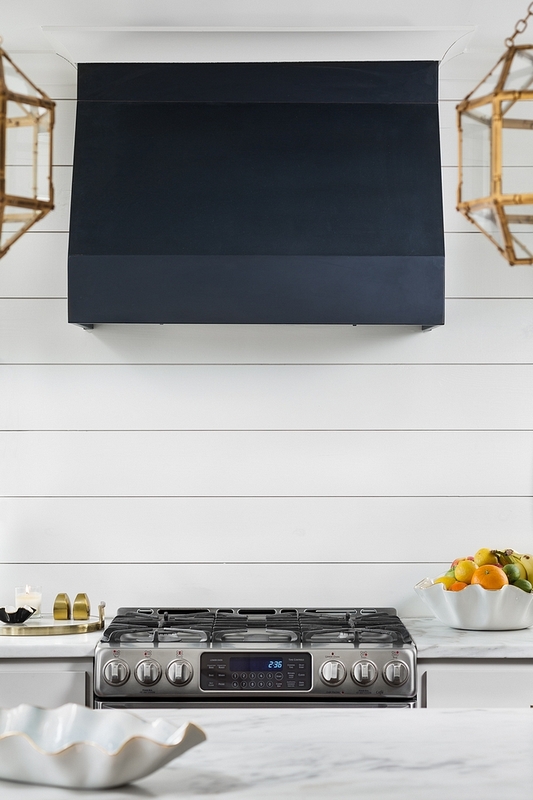 The shiplap backsplash is painted White Tie by Farrow & Ball. 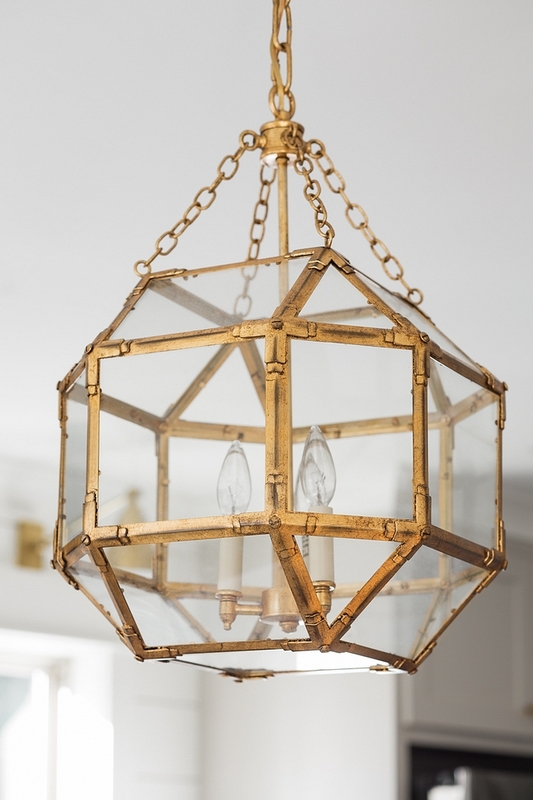 Kitchen Pendant Lights are from Joss & Main (discontinued) – similar here & here. The primeter cabinet color is Revere Pewter by Benjamin Moore. 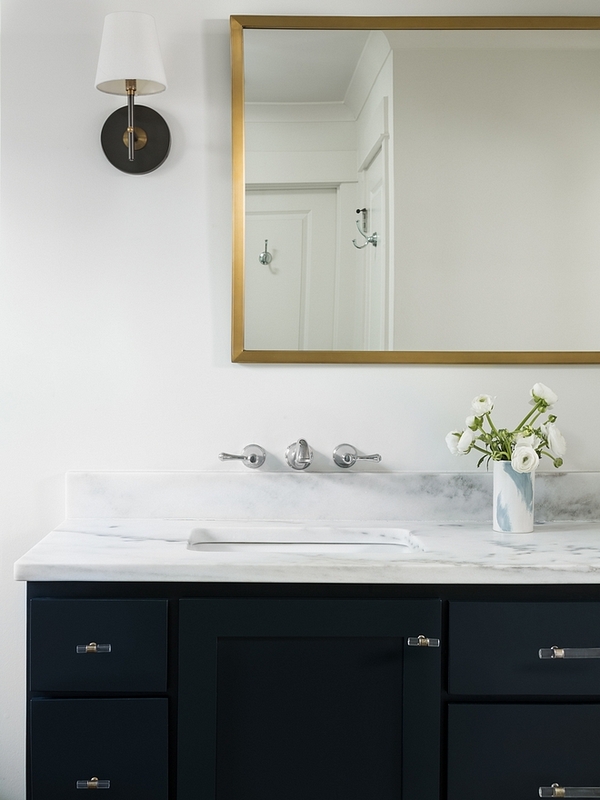 It works beautifully with the Montclair Danby Honed marble countertop. 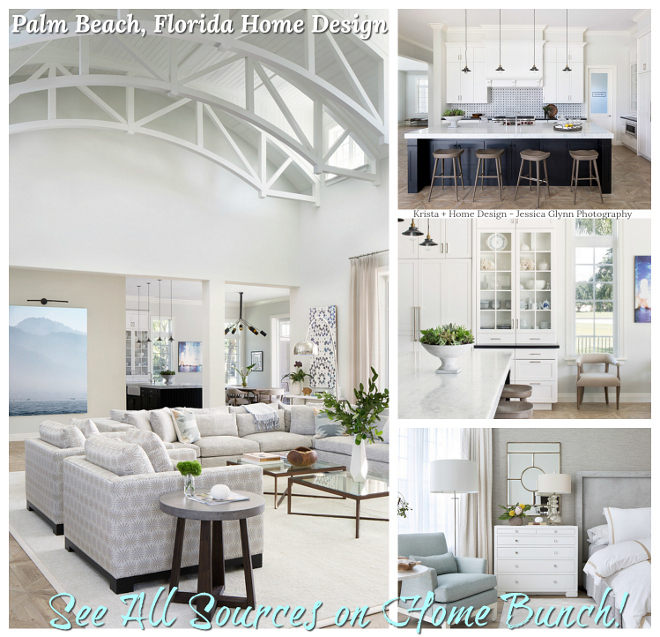 Kitchen Sconces are from Mayer Lighting – similar here. Similar Kitchen Sink: here, here & here. 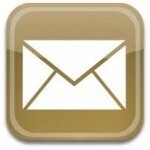 Kitchen Faucet: Kingston Brass Polished Brass Bridge Kitchen Faucet. The custom kitchen shelves are painted in Benjamin Moore Revere Pewter to match the cabinets. 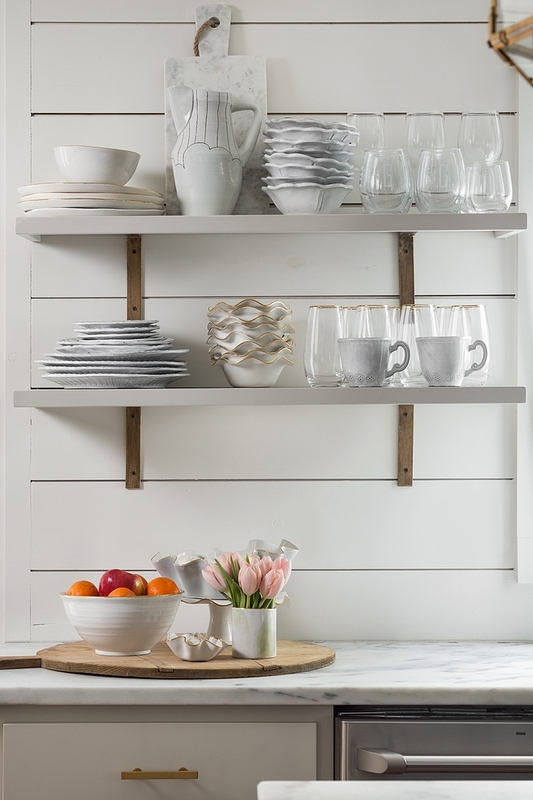 Beautiful Kitchen Shelves: Here & Here. 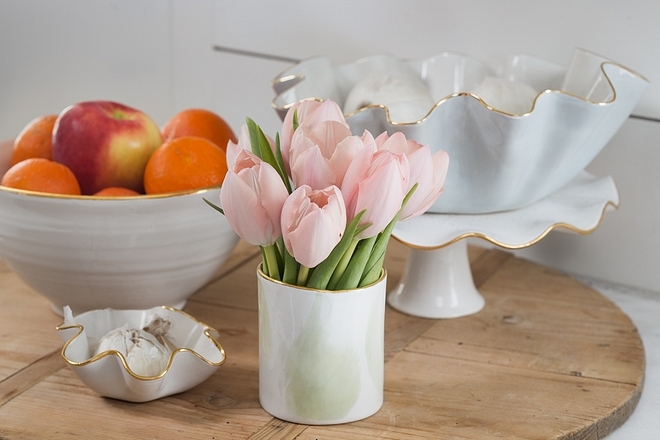 Most of the handmade pottery in the house was done by the talented homeowner, @susangordonpottery. The pantry door was also painted in Blue Black by Farrow and Ball. 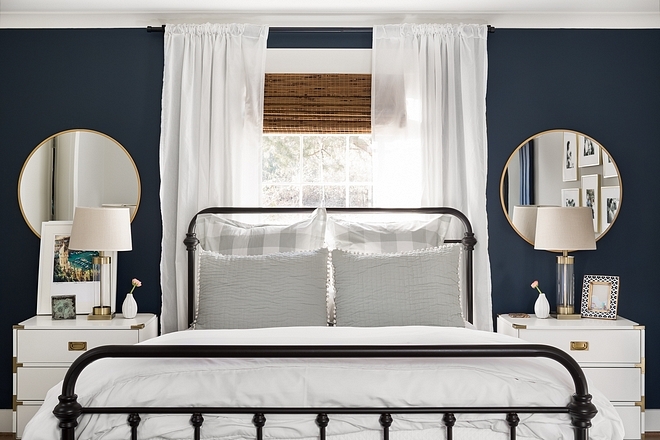 Paint color is White Tie by Farrow and Ball. Walls feature a flat finish. The dining room ceiling is a custom curved x shape with shiplap. 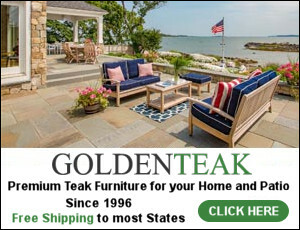 Similar Dining Tablet: Here – Bench: Here. The Dining Room Light is from Visual Comfort. 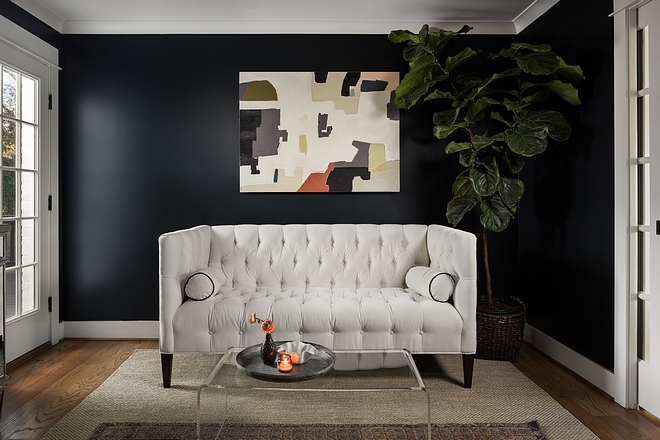 Painted in Blue Black by Farrow and Ball, the living room feels dramatic and elegant at the same time. Similar Acrylic Waterfall Coffee Table: Here. Bookcase and trim paint color is White Tie by Farrow and Ball in semi-gloss. 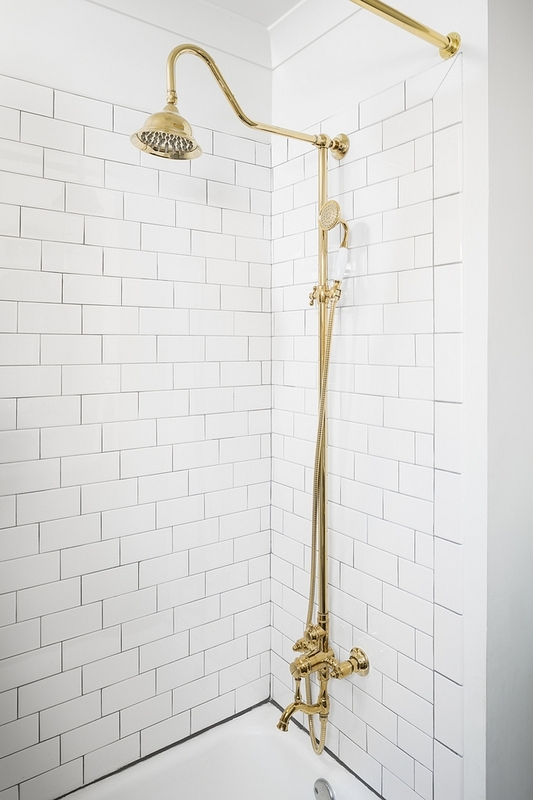 With white walls and brass accents, this guest bathroom feels timeless and chic. 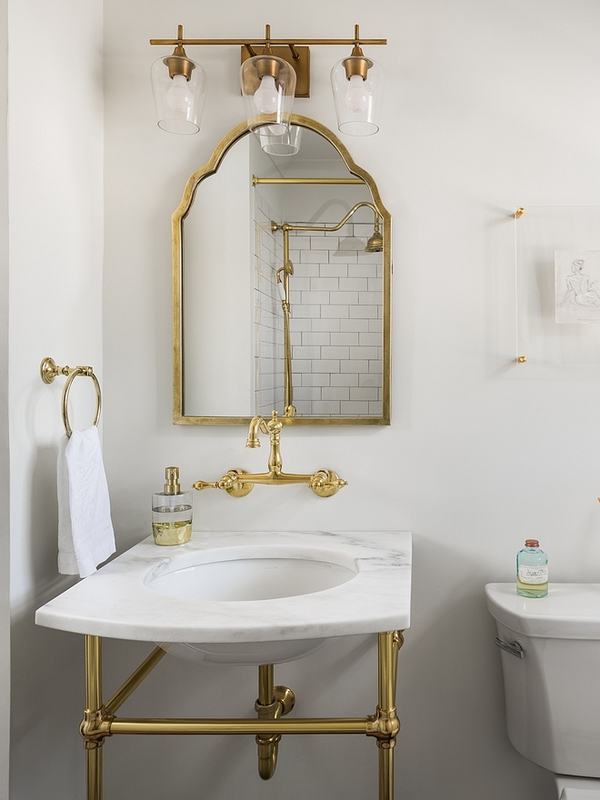 Similar Marble and Brass Bathroom Basin: Here. 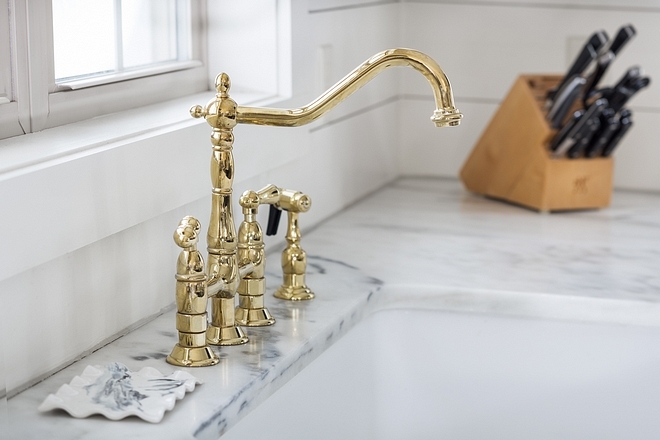 Plumbing fixtures are from Signature Hardware – similar here. The master bedroom feels very inviting. Similar Nightstands: Joss & Main. Similar Grey Gingham Shams: Here. 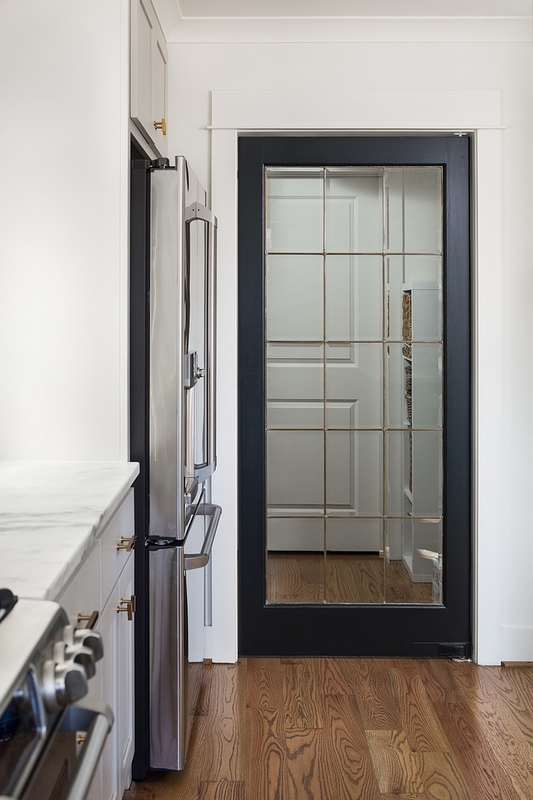 Inspired by barn doors, these custom doors are painted Blue Black by Farrow & Ball. 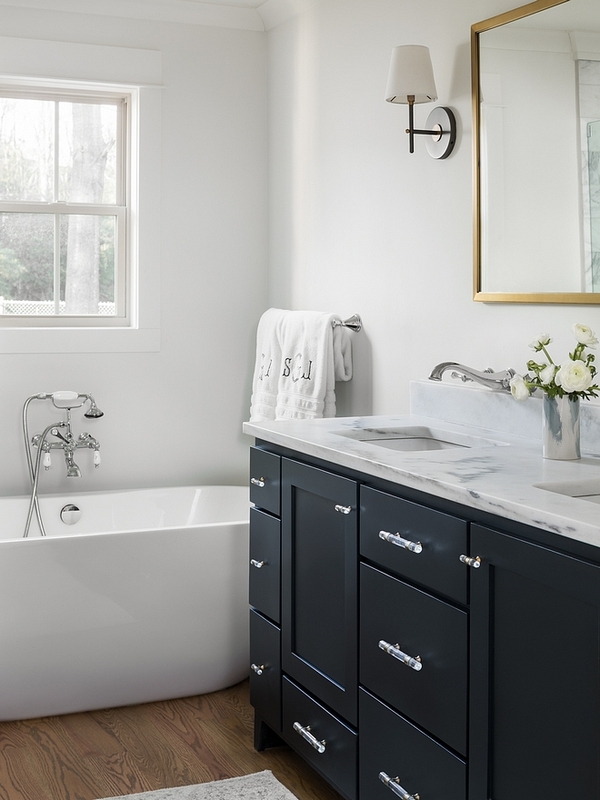 Custom Cabinetry is also painted in Blue Black by Farrow & Ball. Countertop is 3cm Montclair Danby Honed marble. Similar Acrylic Hardware: Knobs & Pulls. Similar Bathtub: Here & Here. 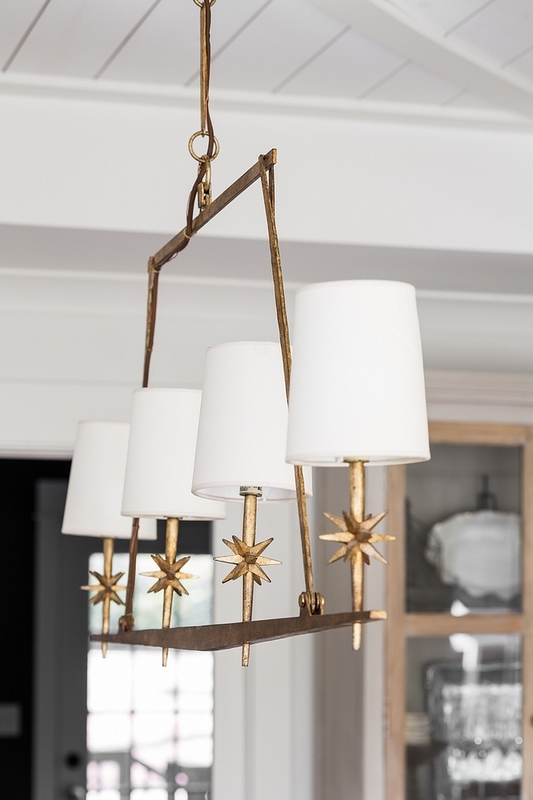 Master Bath Sconces are from West Elm, Arc Mid-Century Sconce. 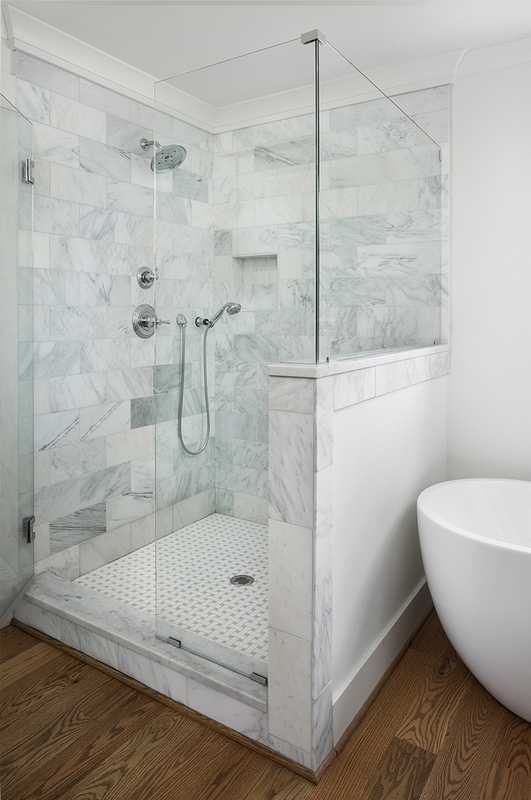 Shower walls 6×12 Arabescato Carerra Honed – similar here. Sterling Grout. Shower floor tile is Primate White/Gray Basketweave tile – similar here. Shower floor border 6×12 Arabescato Carrara Honed custom cut to make border. 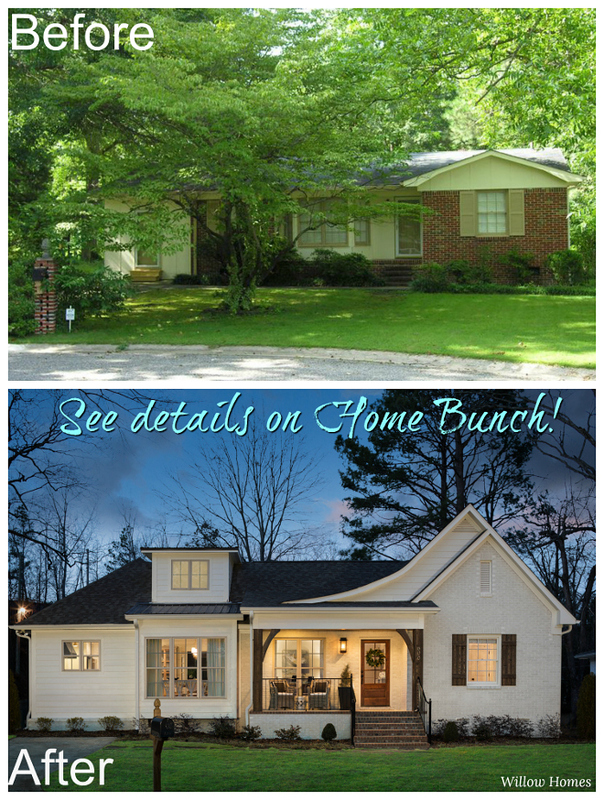 New-Construction Home with Floor Plan.